Peroneal spastic flatfoot has often been associated with tarsal coalition. This case report presents a 2-year-old girl with a fibrous coalition at the calcaneonavicular joint that became symptomatic with peroneal spasm after an inversion ankle injury. The premature onset of calcaneonavicular coalition symptoms combined with the 6 year follow-up after successful conservative treatment with plaster cast make this case unique. 1 – Diplomate, American Board of Foot & Ankle Surgery, Certified in Foot Surgery, Private Practice in North Carolina with offices in Boone, Mars Hill, and Spruce Pine. Partner at InStride Foot and Ankle: Alta Ridge Foot Specialists Division. Calcaneonavicular and talocalcaneal coalitions account for most cases of peroneal spastic flatfoot . In a study of 3,619 army recruits in Canada, Harris and Beath found 74 cases (2%) with associated peroneal spastic flatfoot . Peroneal spastic flatfoot can be a sequela associated with a tarsal coalition . This is likely a subconscious measure by the peroneus brevis tendon to reduce the painful joint motion. The cause of tarsal coalition is unknown. A calcaneonavicular coalition most commonly becomes symptomatic in the 2nd decade of life between 8-12 years old . Coalitions may be classified as a synostosis (osseous union), or a syndesmosis (fibrous union), or a synchondrosis (cartilaginous union). Combinations of these may exist as well. A cartilaginous or fibrous union may later develop into an osseous union . This case was rare in the sense that the patient became symptomatic much earlier in life than usual, and a 6-year follow-up allowed for long-term observation of the patient. A one year and nine month old female presented to clinic in September of 2009 and had twisted her left ankle in the direction of inversion 6 months before. She had symptoms of aching and mild swelling with activity along the lateral aspect of the left foot, per the patient’s parents, since the injury. Due to the chronic foot pain and mild swelling, her pediatrician was having her evaluated for Juvenile Rheumatoid Arthritis when she was also referred to our clinic. Her past medical history, medications, and allergies were all unremarkable. Pertinent family history included arthritis and hypertension. Pertinent surgical history included removal of tissue from her right foot by another surgeon that was pathologically identified as synovitis. Physical examination revealed a mild limp and increased flattening of her left foot with prolonged walking. 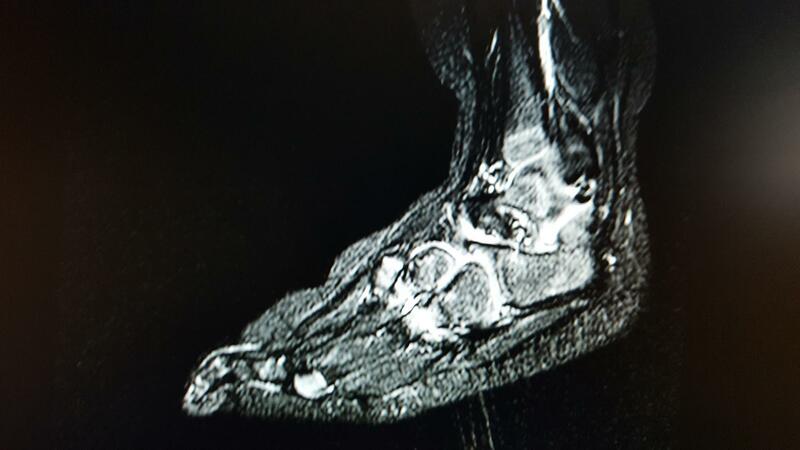 The patient clearly had limited range of motion at the subtalar joint and midfoot. With repetitive eversion of the foot, a stutter-like tonic spasming of the peroneal tendon was clearly evident, and increased as more eversion was exerted. The foot also took on a more valgus position with the tonic spasming. Normal range of motion was evident on the contralateral limb. 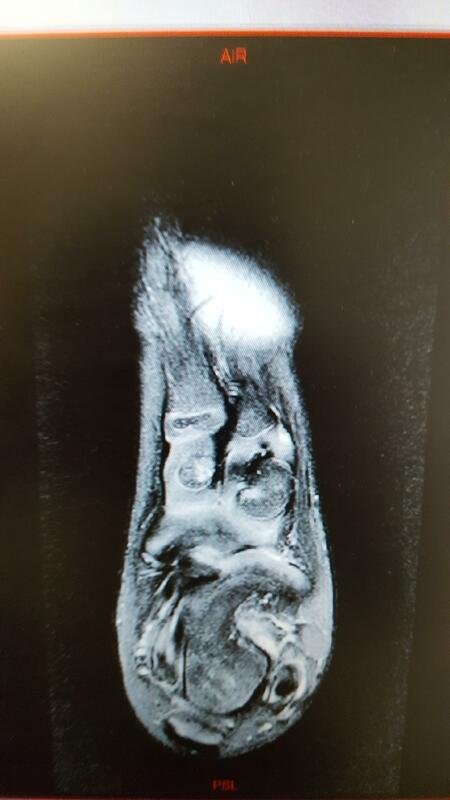 An MRI was obtained to evaluate for potential tarsal coalition (Figure 1). The MRI findings were consistent with a fibrous coalition at the calcaneonavicular articulation with edematous changes in the adjacent osseous structures. Surgical intervention was discussed, but initial treatment was instigated with plaster cast application to rest the area. After four weeks of cast immobilization, she was returned to sneakers with an OTC arch support. At her follow-up visit four weeks later, she was walking normally and without any symptoms subjectively or on exam. Peroneal spasm could not be recreated on exam. Figure 1 Fibrous coalition at the calcaneonavicular articulation with edematous changes in the adjacent osseous structures. The patient returned to clinic yearly for four years and then was followed up by telephone for the past two years and there has not been any return of the bothersome symptoms with peroneal spasm or limping. About two years after the cast immobilization, she began using a custom foot orthotic to control the foot biomechanics. She has been asymptomatic and able to participate in regular childhood activities including dance, recreational soccer, and running without any complications to this point. Medical literature identifies calcaneonavicular coalitions being symptomatic between ages 8-12. This unique case is presented of a one year and nine month old developing a symptomatic calcaneonavicular fibrous coalition with peroneal spasm secondary to trauma. The coalition was diagnosed by clinical findings and MRI. After treatment of four weeks of cast immobilization and follow-up treatment with orthotics over the past six years, the patient has been able to continue comfortably with high level activities. It appears that conservative therapy has been successful thus far in reducing pain from her tarsal coalition with peroneal spasm. It will be important to observe if the tarsal coalition becomes symptomatic later in life when the patient reaches 8-12 years of age. I appreciate my friend and colleague, Kurt A. Massey, DPM, FACFAS, allowing me to discuss this patient with him as I initially provided her care. I also recognize the fine work by the radiologists at the Johnson City Medical Center, Johnson City, TN, with the patient’s imaging. Tachdjian M O. “The Foot and Leg”, Pediatric Orthopedics. p. 1346, W.B. Saunders Co., Philadelphia, 1972. Harris R I, and Beath T Army Foot Survey. Ottawa. National Research Council of Canada, 44, 1947. Downey M S. “Tarsal Coalition”, Comprehensive Textbook of Foot Surgery. p.899, edited by McGlamry E D, Banks A S, Downey M S. Williams & Wilkins, Baltimore, 1992. Downey M S. “Tarsal Coalition”, Comprehensive Textbook of Foot Surgery. p.904, edited by McGlamry E D, Banks A S, Downey M S. Williams & Wilkins, Baltimore, 1992. Downey M S. “Tarsal Coalition”, Comprehensive Textbook of Foot Surgery. p.901, edited by McGlamry E D, Banks A S, Downey M S. Williams & Wilkins, Baltimore, 1992. This entry was posted in Uncategorized and tagged peroneal spasm, tarsal coalition. Bookmark the permalink.